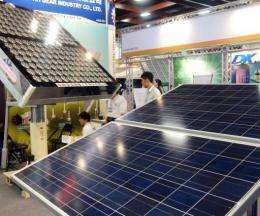 Large solar panels are displayed at the International Photovoltaic Forum and Exhibition in Taipei's World Trade Centre in October 2009. Taiwan plans to boost its use of solar panels by a factor of 200 over the next decade and a half in an effort to increase clean energy, a ranking official said Friday. Taiwan plans to boost its use of solar panels by a factor of 200 over the next decade and a half in an effort to increase clean energy, a ranking official said Friday. Solar panels across the island currently have a capacity of five megawatts, enough to power 500 buildings, but by 2025 that figure is targeted to rise to 1,000 megawatts, said Wang Yunn-ming, deputy head of the Bureau of Energy. "We hope to encourage the use of renewable energy with competitive prices," Wang told AFP. Taiwan's parliament in June passed a major renewable energy bill which is aimed at adding between 6,500 and 10,000 megawatts of installed energy from renewable sources over the next 20 years. Currently, Taiwan produces only 2,278 megawatts, or 5.8 percent of installed capacity, from renewable sources, according to the state-run Taiwan Power Co. Under the bill, the government will offer incentives and loosen regulations on renewable energy providers, creating a pricing mechanism for various sources of renewable energy, such as solar or wind. The government will set the wholesale prices for renewable energy by year-end, Wang said. The bill was welcomed by industry watchers, who estimate it will generate at least 30 billion Taiwan dollars (930 million US dollars) in investment in the first year and create more than 10,000 jobs, local media have reported. The clean-energy industry is expected to produce some 100 billion Taiwan dollars in revenue within two years, reports said. Until solar panels are more cost-effective, such ventures are a waste of money. Put the money into solar cell research instead of into massive installations of existing, inefficient technology. If/when they achieve cost-effectiveness, the market will take over.